The living room and dining room of this house have been blue since we moved in last year. The top half of the walls are blue, the wallpaper on the bottom half of the walls is blue, the carpets are blue, and the futon and chair are have blue furniture covers. Living in a Smurf village will make you crazy after a while, and it was time to tear the paper down to make the rooms ready for painting. We’ve wanted to change the look of this room from the very start, but other things kept jumping to the top of the priorities list. Replacing the carpets is what I most wanted to do, but that’s a more expensive adventure that will have to wait a little while. Paint is cheap and will make a huge difference, so that will be the first step. But before painting, the wallpaper needs to come off. We assembled some sponges, a bucket of water, and a couple of scrapers, and sat in the hallway to get started. I tried to soak the first panel with a sponge, but the paper is textured and smooth, and feels like it’s made of plastic, so the water just beaded right off it. I picked at a corner until I got a little piece to pull on, and I tugged – the whole thing peeled right off in one wide strip. And nearly every piece came off like that, without even needing to wet the walls or scrape. There was only one panel with excess glue that needed extra work, and we’ll need to patch the wallboard there before we paint, but the rest was an absolute breeze! But, naturally, nothing we’ve done in this house comes without a surprise. I thought the blue was bad. 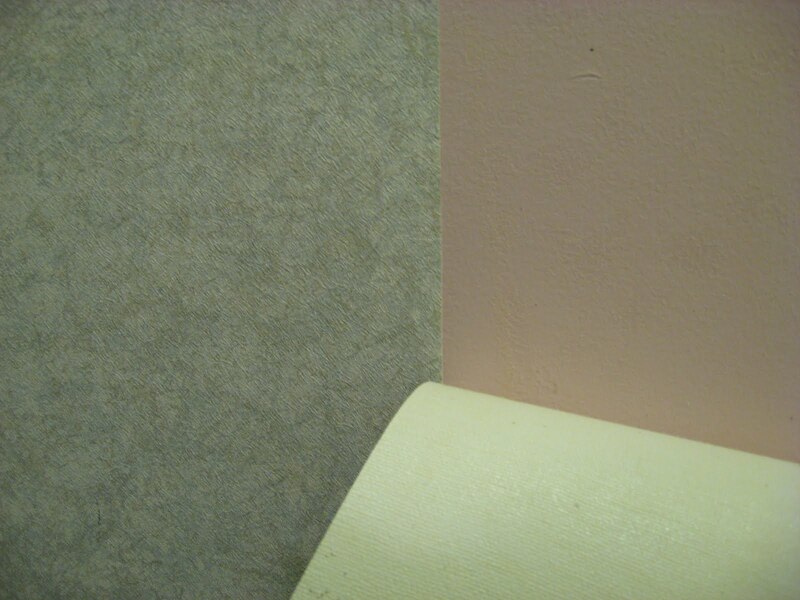 Underneath the wallpaper, hidden by the textured ugly, was an entirely different ugly. Pink. Pink. Little-old-lady pink. Chalky pink. Horrible, horrible pink. 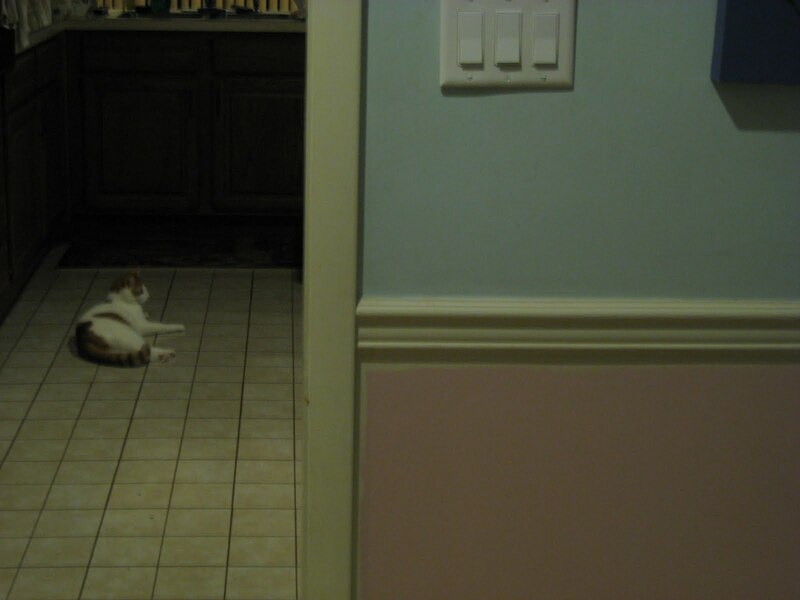 So now, until we can wash the walls and start painting, two huge rooms in my house are two-colored monstrosities. At least this will motivate me to get the painting done fast, because this is entirely ridiculous. And yet, someone painted their house this way because they thought it looked great! Why would you do this to innocent walls? Expect a painting update within a couple of weeks. Unless I go blind before then. This entry was posted in Uncategorized on April 18, 2011 by antijen.